Mick Jagger once asked Mary Jo if she was the Famous Bower Bird person. Her love of birds and animals started as a young child when her mother would constantly send her outside because of her massive energy. She would fiercely dig for worms; play with bugs, tadpoles and frogs. At a very early age she was drawn to Mother Nature. As a child she vacationed with friends and family usually on or near the water. Mary Jo’s expressive examples of “seeing the world differently” developed in her early paintings of harbors, colorful fish, crabs and shells. When she went exploring she found flowers to be exploding with radiant shades of red, blue and green and when mixed created every color known. She spent time teaching blind children art (especially clay) and received a scholarship to New Paltz University in New York for the summer. Her education continued on at Wheaton College where she graduated in 1957 with a B.A. in Art History. She got married in 1959 and traveled the world with her commercial pilot husband. They lived on a boat for a while where she lost some of her paintings in a wild Bohemian storm. Mary Jo fell in love with people and places like Haiti, Africa, Indonesia and New Guinea. They settled in Marblehead, Massachusetts and started a family, giving birth to three girls Elizabeth, Alexandra and Amanda. Mary Jo was with her daughter Alexandra when she happened to discover a baby bird at her front door. She carefully picked the bird up and was struck by its delicate beauty and colorful feathers. This experience sparked her fascination with birds and she began funneling her artistic energy into collecting, breeding and painting birds. Her love of birds is more then just a fascination, she is obsessed. She surrounds herself with the things she loves, even sleeps in a room of living birds (including an African Hornbill named Millie), a butterfly collection, flowers, a fountain and koi pond with real fish. She raises Weavers, small birds resembling finches that creatively weave colorful nests. 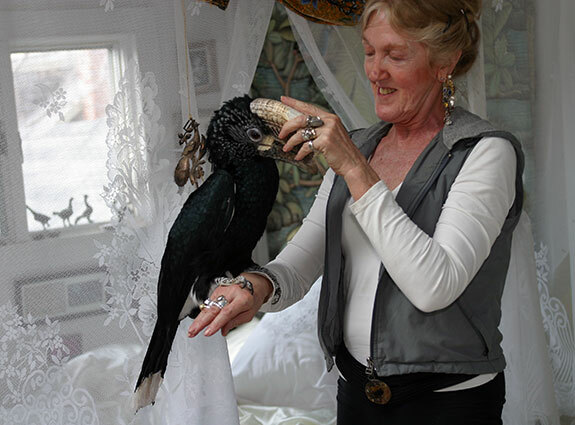 Mary Jo strongly believes that birds such as the Weaver and Bower are true artists. Her signature work includes paintings of large feathers from various birds. After her children left home, she started to play with different mediums, of all things, egg mixed with powdered color. Added a bug, a flower or plant and experimented, finally creating her Encaustic and Silver series. Mary Jo had one very dark time in her life, her divorce from her husband of 40 years, which culminated into her Abstracts and Storm series. Her dark time was brief and she soon rediscovered her true passion “Color”. This is evident in her current painting “Bougainvillea”. Mary Jo became entranced by the beauty of Indonesia. From the peacefulness of its natives and tropical greenery exploding with natural color to the sounds of the exotic birds flying freely, she can be one with Mother Nature. She’s been traveling to Bali for over 30 years and Papua New Guinea since 1992. It takes her hours to climb up the Hungku mountains with the help Chief Moses and his tribe. There she studies and paints the luminous Bower bird. Watch below her annual trip to Papua New Guinea on Frontline/World on PBS called “The Clever One.” She is a fascinating person full of life and colorful experiences that only she could tell and while this page is about her it can’t hold a candle to who she really is.